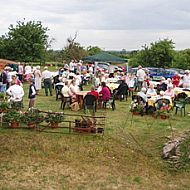 The Brewer family held their annual Coffee Morning at West Lyng Farm near Taunton on the 1st June. David Brewer said "We’ve been holding this annual event for over 10 years now. 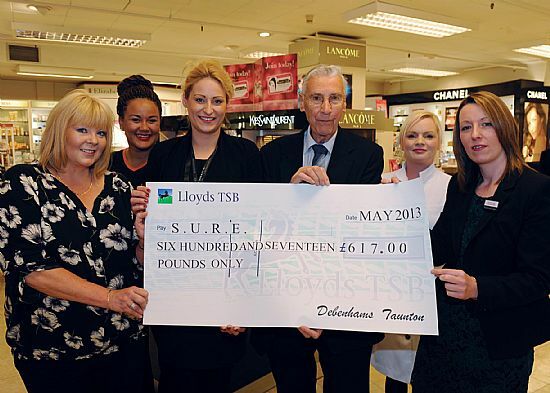 This year the total raised was over £1,400." Customers at Esso On The Run garage, Wellington Rd, Taunton, have always been encouraged to put spare cash in the SURE collection pots at the tills. By the end of May this year nearly £2000 has been raised. 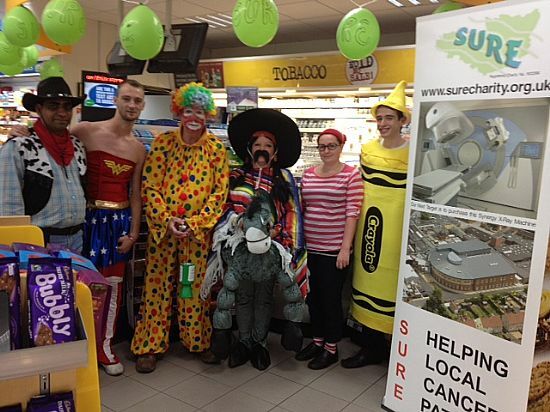 The Esso bosses announced we could hold a charity day for a specific charity, Chris Patterson had no hesitation to nominate SURE and to organise staff to wear fancy dress and to make the customers smile. Thanks to their very kind customers digging deep over £500 was raised. Pictured are Roy, Rob, Chris, Teresa, Dawn and Ash. Organised by Louise Wright and Kim Trump, it was a fun evening, many enjoyed the pamper sessions and the fabulous raffle prizes. Some just enjoyed the wine and strawberries and cream. A very big thank you to both Management and staff who dedicated their evening to the event. The generosity and local support has shown itself in the support it gives to SURE £617.00 is a wonderful donation. Thank you. 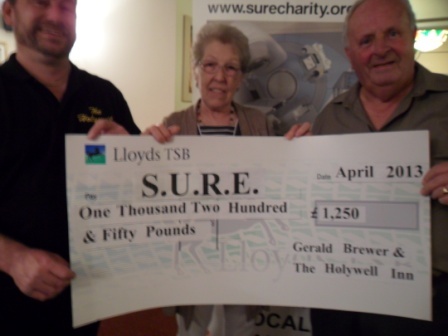 A well attended Horse Race Night held at the Holywell Inn on 6th April resulted in a cheque for £1,250 being presented to S.U.R.E. In the picture are, from the left, Vic (Victor Bigg) the landlord at the Holywell Inn, Vicky Gordon of S.U.R.E. and Gerald Brewer the organiser of the evenings event. The event held at North Petherton Community Centre on Saturday 20th April 2013, 6-00pm-10-30pm, raised £194 for S.U.R.E. Described in the event poster as "A Magical Event all proceeds go to Raise a Smile for Harry & The Beacon Centre which are both Cancer Charities. The event included alternative therapists..people giving readings... as well as a variety of stalls. This is a ticket and Adult only event £2-50 per Ticket. 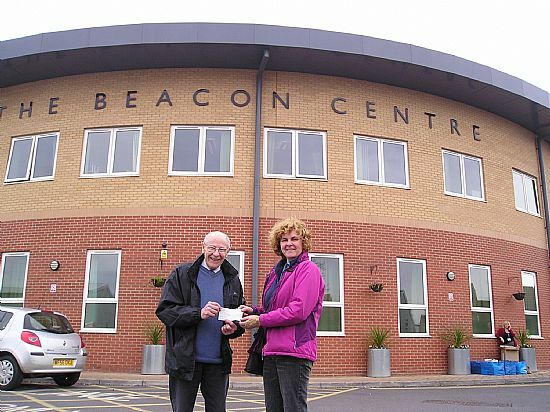 At the Beacon Centre on 17th April 2013 Sarah Trott of the Harlequin Carnival Club Ilminster presented Roy Hole of S.U.R.E. 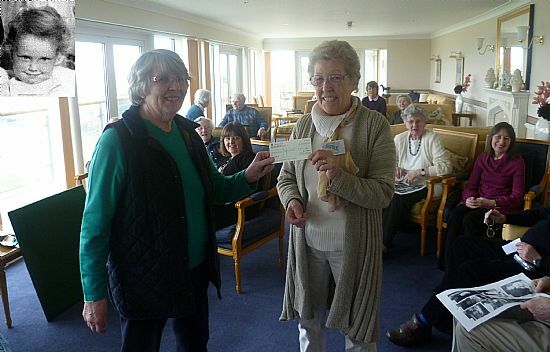 with a cheque for £200.00 raised by the HARLEQUIN carnival club from various fundraising activities. As a way of making money for charity, a collection of photos of Pegasus Court, Taunton residents was displayed and everyone was invited to suggest who they grew up to be. It was thought that all it entailed was to convert the dimples into wrinkles and colour the hair to grey and it would be no problem. Obviously it was not that easy. 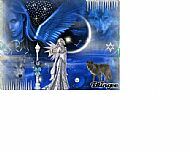 The best result had only six correct answers and they wished to remain anonymous. Three tied for second place so a tie break was introduced. This took the form of famous people as babies. This eliminated one but the other two had the same number of correct answers. Fortunately there were two prizes so they were able to have a prize each. Since the time when the photos were taken some of those sweet and innocent children were no longer recognisable. We hope that too many were not offended by this when nobody was able to spot them.. 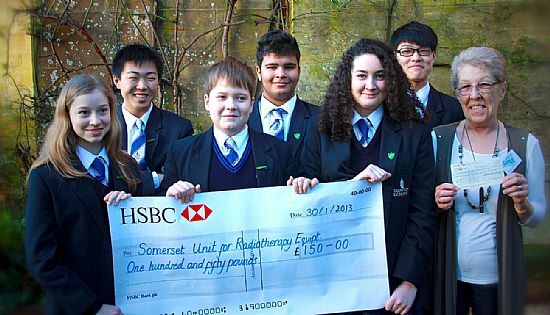 Altogether the entry forms and the raffle raised over £100 for The Somerset Unit for Radiotherapy Equipment, a local charity which was instrumental in bringing radiotherapy equipment to the local hospital and saving all those tedious journeys to Bristol. Now the money is used to improve facilities. Vicky Gordon of S.U.R.E. The inset picture is Heather, our Manager when she was young and sweet! Flowers International of Eastover Bridgwater recently held a very successful and well attended Flower Demonstration, they also kindly incorporated a raffle into the event, for the local cancer charity S.U.R.E. and raised an impressive £130.00. Our thanks go to Flowers International and their customers for this welcome donation. As Christmas was approaching, we were looking to purchase a tree for our entrance hall. It was recommended that we spoke with Mr Herbert, one of our neighbours in Kingston St Mary, as he raises money by providing Christmas Trees in return for donations to SURE. He supplied us with an absolutely beautiful tree which filled the School with Christmas spirit. As a School we felt we would like to do more for the charity. The children here at Taunton School International Middle School held a special Christmas Competition where they paid ‘£1 a go’ to guess the number of baubles, the height and the cost of the Christmas tree. We also opened our doors to the local community for a Christmas Celebration Morning. Our newly formed Funky Music Group sang a few Christmassy tunes and donations were collected. Vicky Gordon, Publicity Coordinator for SURE, very kindly came on behalf of the Charity and talked to the children during assembly. She explained in more detail how the money raised was allocated and how the next project, a synergy imaging system, will enhance specific treatment areas of the body. The School’s Prefects and Form Captains presented the cheque for £150 to Vicky Gordon in the grounds of The Grange in Kingston St Mary.